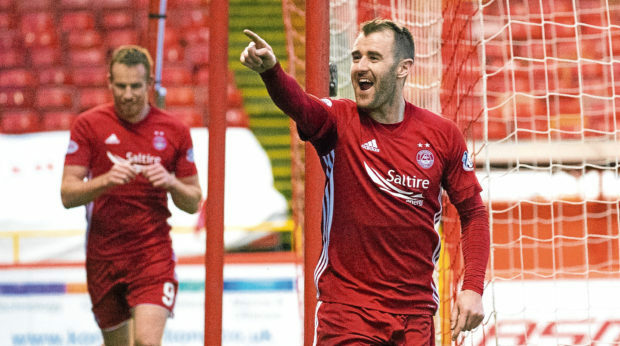 Aberdeen attacking midfielder Niall McGinn is optimistic Sunday’s Scottish Cup semi-final will finally be the time the Dons get the better of Celtic. Derek McInnes’ side have only won one of their previous 15 matches against the Hoops – a 1-0 win at Parkhead on the final day of last season when the Celts had already been crowned league champions. The Dons have faced Celtic in three Hampden finals since 2016, including this season’s 1-0 League Cup final defeat, but failed to overcome the Glasgow side at the National Stadium. But former Celt McGinn hopes the Hampden Hoops hoodoo comes to an end this weekend. He said: “There is no looking away from it, we are definitely due a victory against them and hopefully that will be in the semi-final. “The confidence is good and we have been very good away from home this year. “We have been hard to break down and hopefully that will be the case in the semi-final. “In a semi-final you always have to go into the match feeling confident and optimistic. “They are always hard games to win, which has been the case over the last few years, and they might not be classics to watch. “I don’t think many people gave us a chance to go to Ibrox and beat Rangers in the quarter-finals, never mind playing Celtic at Hampden. “People were talking about an Old Firm semi-final but we just concentrated on ourselves. “It is going to be a very tough game but we have to take confidence from how we have played over the last couple of years in Glasgow. McGinn was unsurprised to see his former Celtic manager Neil Lennon given the chance to return to the Hoops as caretaker manager following Brendan Rodgers’ departure to Leicester City in February. But the Northern Ireland international knows Lennon’s prospects of landing the job on a permanent basis will likely be determined by his ability to guide Celtic to a third successive clean sweep of the domestic trophies. He added: “Given the circumstances, I think he was the best fit for the job. “Neil has been there before and achieved a lot at the club, both in his time as a player and as a manager. “In terms of his experience, it was probably a no-brainer for them. “He has obviously come in and hit the ground running with a few important results. “They have picked up a few late winners which can only give them confidence.